Well as you can see, I'm reading up on nourishing my (and our little family's) mind, body and soul. 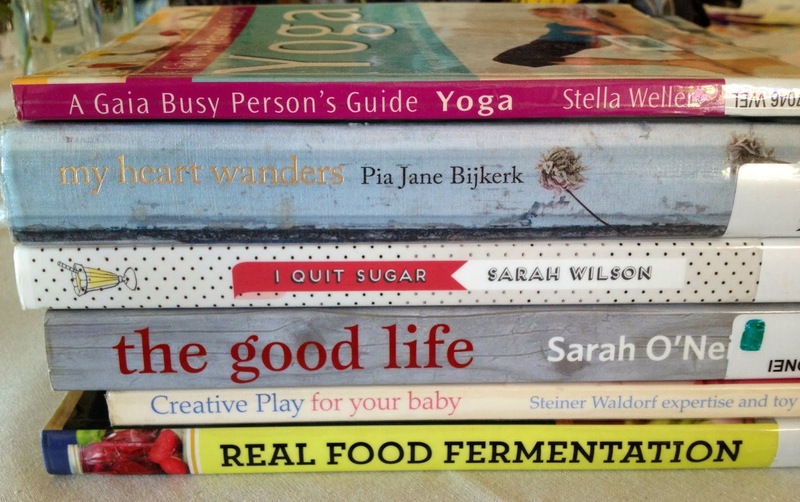 The fermenting of food has long been on my to do list, but I have to say I've been a little daunted by the whole process, so I'm hoping that by researching it a bit more, it won't seem so scary. I'd love to make our own sourdough bread so that might be the one to start with - I may just have to jump right in the deep end and not think too much about it (something I have a tendency to do). The 'I quit Sugar' has been one that keeps popping up everywhere and I've been intrigued, especially with these 'new' findings that suggest that it's really sugar, and not fat, that's bad for us. I saw it at the library and I'm glad I borrowed it - it makes sense to me so far, and the recipes at the back look simple and delicious. What can I say about 'My Heart Wanders'.... beautiful, inspiring, escapism at its best. I love travel books, particularly those that are about living in another country (particularly Paris) and this one was lovely. The author actually lives on a house boat in Amsterdam at one stage...wow. I've just finished 'Eleanor and Park' by Rainbow Rowell which was sad and so very, very sweet, AND it has a nice ending. I'm a sucker for a book with a nice ending....that's the romantic in me I guess. I haven't finished a book in forever! I'm reading the Hundred Year Old Man Who Climbed Out the Window and Disappeared at the moment. It's full of strange and horrific happenings but deals with them with great wit and humour, so far I love it! My Heart Wanders sounds lovely, I'll need another bit of escapism when I, fingers crossed, finish my current book!